This is a reprint of the guest post I did for Skip To My Lou's Craft Camp. Enjoy! 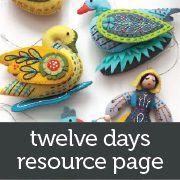 Hey, Craft Campers! I'm delighted to participate in this summer kid-craft lineup. 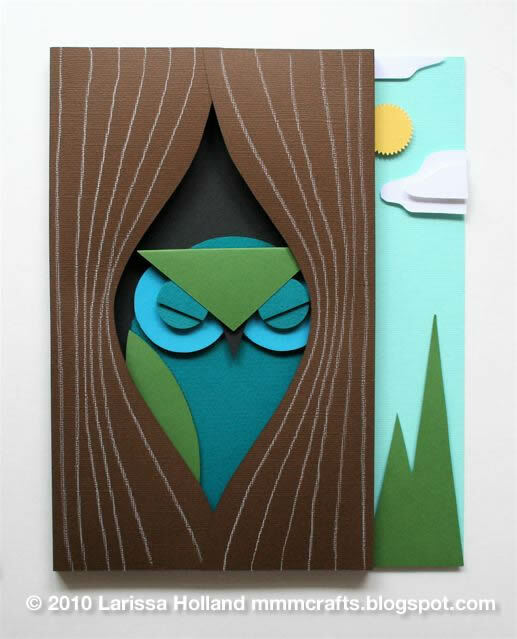 This 3D paper owl art project is for you and your crafty older kids, say around 11-ish years and up, who can wield a pair of scissors, handle smallish pieces and follow placement instructions carefully. 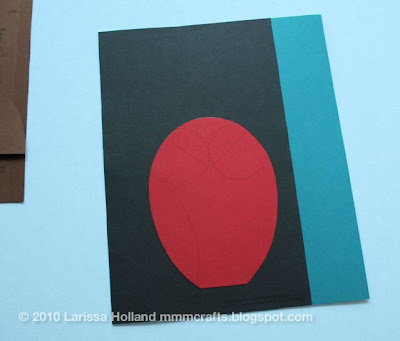 Finished size of the art project is 8 x 10 inches. 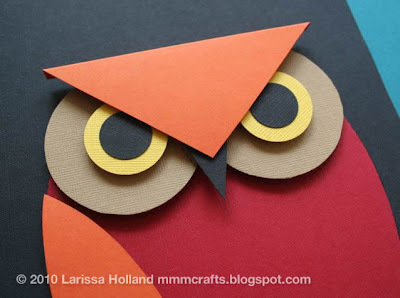 Moms: You can definitely young this down by cutting out the shapes for younger kids, and skipping the pop dots and folding. Just cut off the folded flaps. 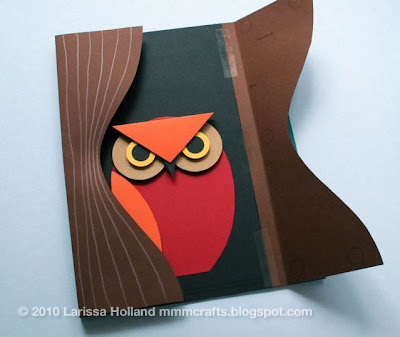 You could also make just the owl and skip the whole background, and it will still be plenty o' fun! Got all that together? 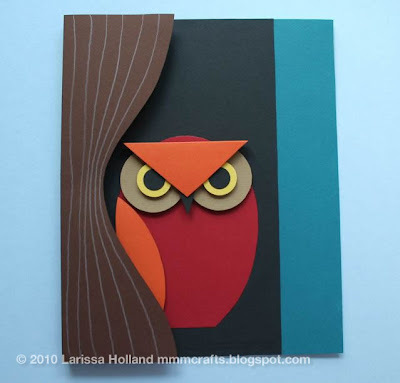 Let's make some mad paper art. Step 1: Print out the pattern pieces! 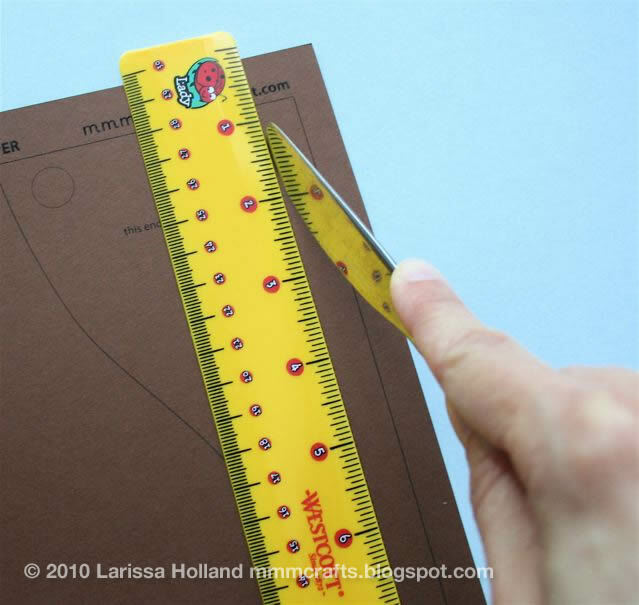 Make a test print of the first page on regular paper and measure the guide box with a ruler to be sure you are printing at the correct size. Once you are sure the scaling is good, follow the instructions on each page to print them on different colors of paper. You won't be printing on your yellow paper. NOTE: some will be printed on the front and some on the back of the page! 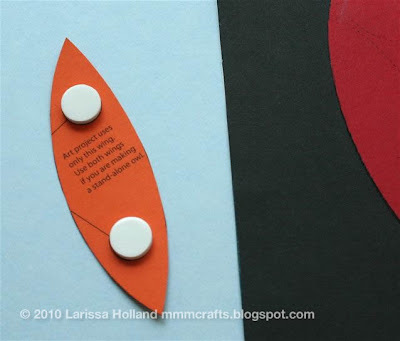 If your paper is not textured and looks the same on both sides, don't bother with this. Step 2: Score all your folds. 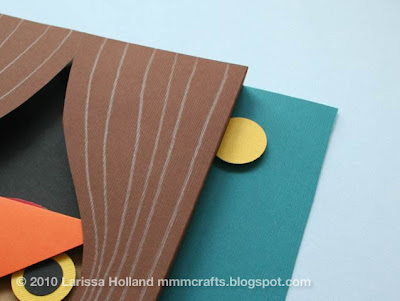 There are three folds to score, two on the brown paper and one on the orange paper. Line up your ruler against the dotted line, and firmly score along the line using your butter knife. Do this a couple of times. This is making a nice dent in the paper so that when you bend the paper your fold will be easy and clean. 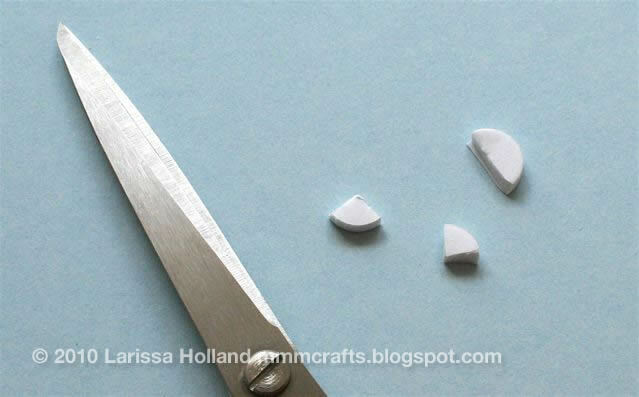 Step 3: Cut out one each of your pattern pieces with scissors. Rough cut shapes away from the rest of the page first. Then cut them out on the lines. Don't try to cut the whole shape in one continuous direction. 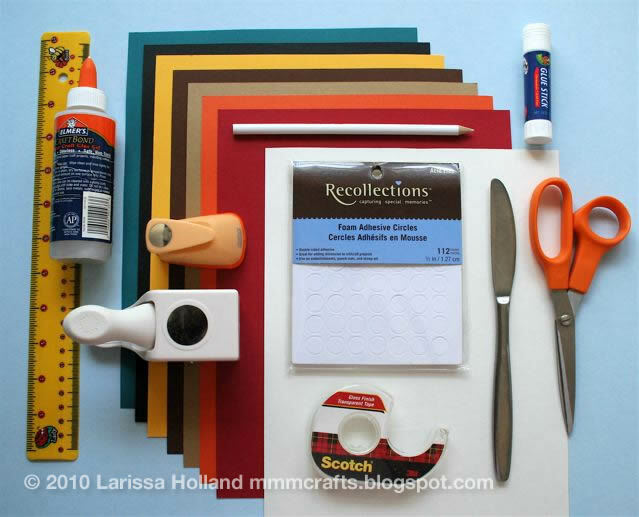 Cut it in stages and from different directions to make it easier. Cut inward-facing angles first from one side to the point, then from the other side to the point, and let the pointed piece fall out. 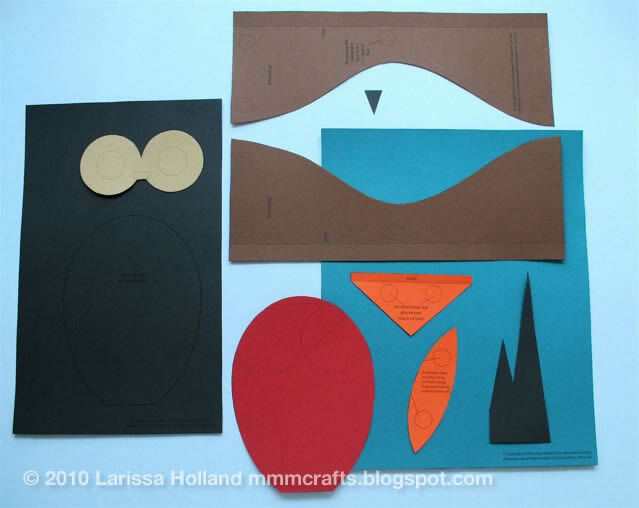 Turn your paper in your hand as you cut curves. Remember it doesn't have to be perfect to look awesome! Step 4: Punch out some circles. Using a 1 inch punch, make three yellow circles. 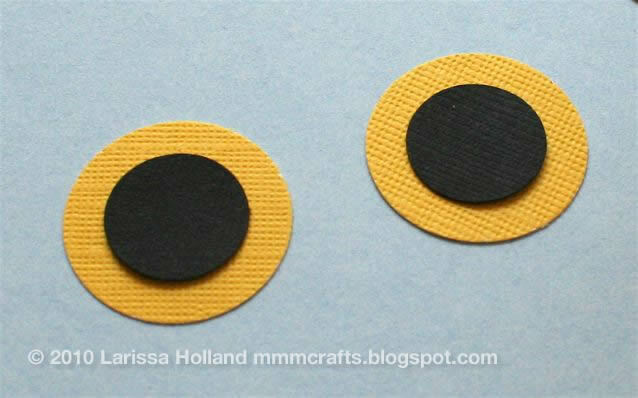 Using a 5/8 inch (or 1/2 inch) punch, make two black circles. Set them aside with the rest of the pieces. If you don't have circle punches, use a compass or you can print the templates provided on the first page of the PDF file. Step 5: Put the background together. Use the glue stick on the back (the side with the lines) of the 8 x 10 inch dark teal piece. 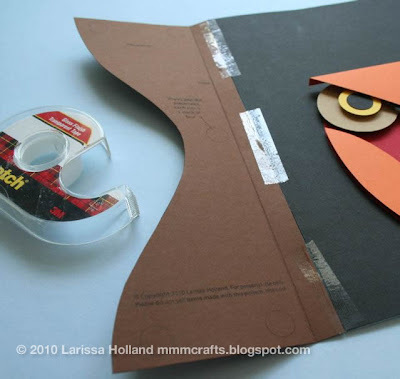 Get glue on all the edges and then zig zag it down the middle. Now place it on the letter sized piece of posterboard. It will probably stick better on the non-shiny side of the posterboard. Don't worry about lining it up with the edges, you'll be trimming the extra off. 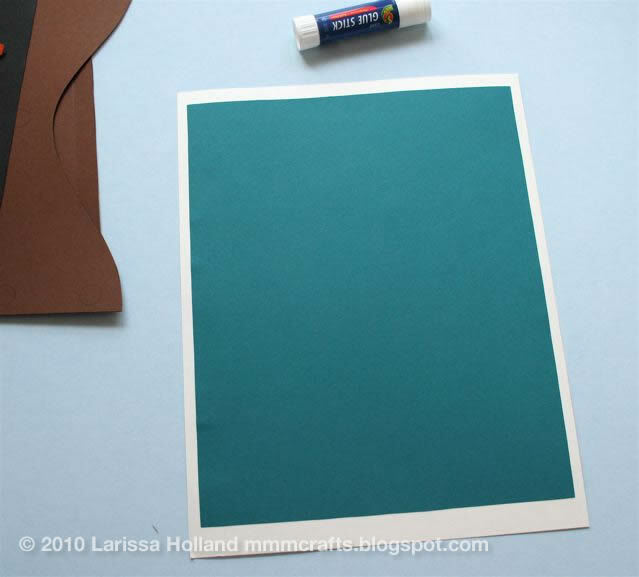 After you smooth it down, trim the extra poster board off the edges. 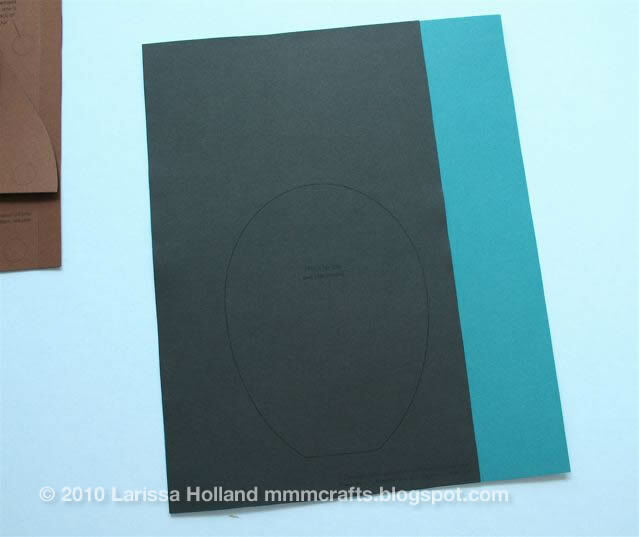 Use the glue stick on the back of the large black piece (the side without the oval on it). Carefully line it up with the left, top and bottom edges. Smooth it down. Step 6: Put the owl together. Hard to see here, but the guidelines will be showing on the red. 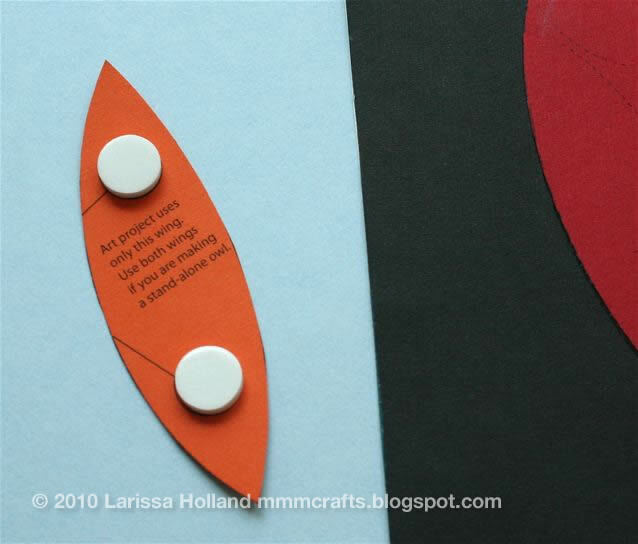 Put two single pop dots on the back of the orange wing where shown. Line up the wing with the guideline on the red oval and stick it down. Ooh. It's 3D. 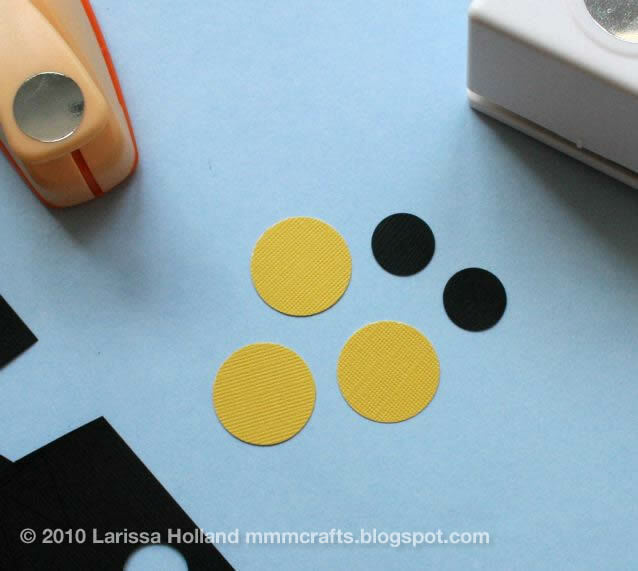 Cut a pop dot into quarters with scissors. Yep, that is small, but you don't want the pop dot to show from behind the beak. 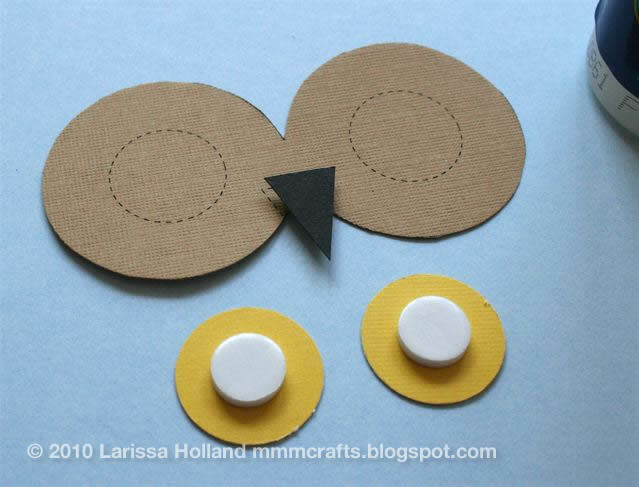 Put one tiny pop dot piece on the back of the black beak and place the beak on the light brown ruff using the guideline. Use gel glue (less is more) on the black circles and place them in the center of two of the yellow circles. Now you have two owl eyes! Wait a minute or two for the gel to dry. Place one pop dot in the middle of the back of both eyes. 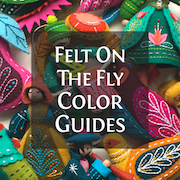 Stick them down over the guidelines on the light brown ruff piece. Flip over the light brown ruff and put two single pop dots on the back. Place it on the red oval on the guidelines. Now for the triangular orange...ears. Or whatever they actually are. Anyway, they look like ears. 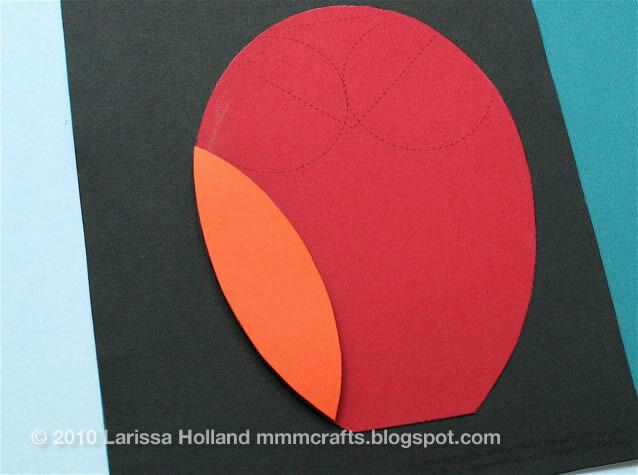 Fold the scored flap toward the pop dot side. 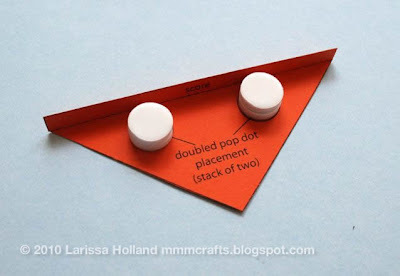 Place two double pop dots where shown by the guide (double means two that are stacked together). 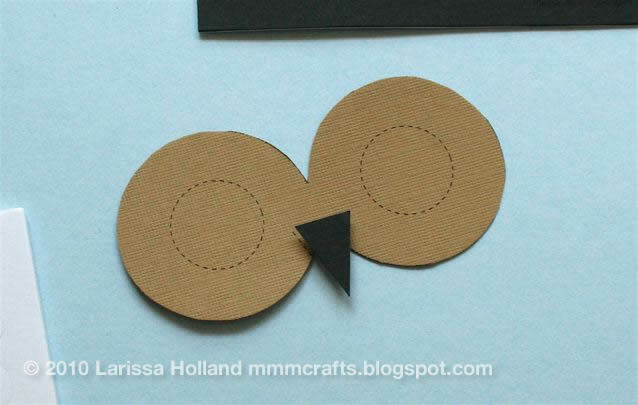 Flip it over and place it on the owl's head, centered with the beak and lined up with the remaining guideline. Man! 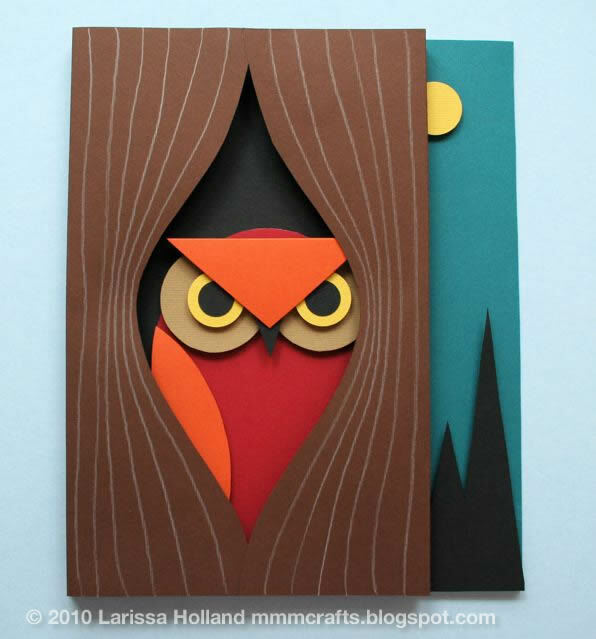 Your owl looks wicked fierce. Make some hooing noises. You know you want to. Step 7: Put the tree trunk together. Flip your tree trunk pieces over to the blank side. 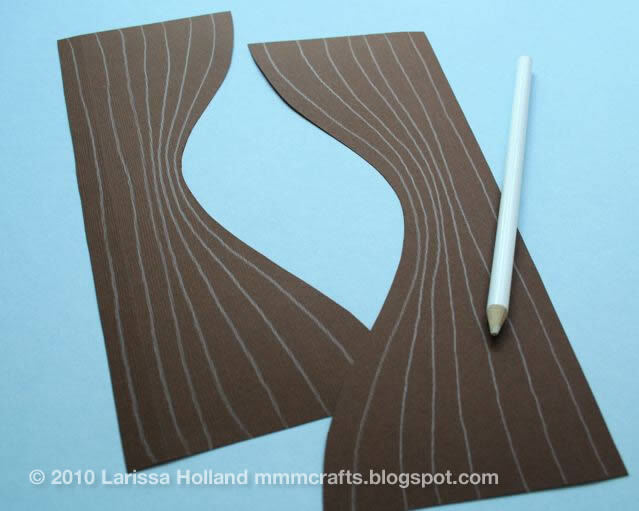 Now, summon up your artistic muse and use a white or gray colored pencil to create bark lines all down the tree trunk. Curve them around the knot hole. Groovy. Very tree-like. 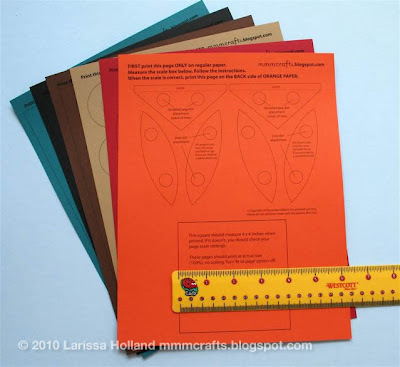 Fold the scored flaps toward the back and crease them. Unfold them. Lay the left tree trunk bark side down, lined up to the left edge of the background. Tape it where the edges meet. Place a stack of four pop dots on each place indicated. 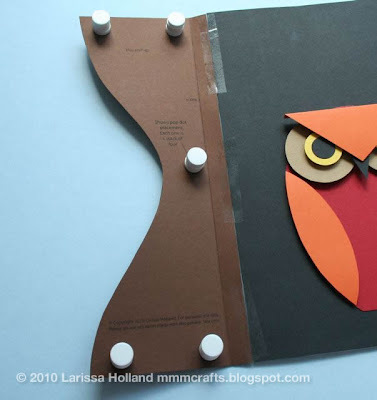 Crease your flap again, then fold the whole piece carefully over and stick it down over the owl, making sure your fold is at right angles. Don't push it firmly down until you are sure the side is straight up and down. Now repeat those steps for the other side, except this time line the right tree trunk up to the edge of the black paper on the right (NOT the edge of the art). Tape it where the edges meet. Place a stack of four pop dots on each place indicated. Fold it over and stick it down over the owl, making sure your fold is at right angles before you press it down. The tree pieces should overlap slightly and hide the bottom of the owl. Voila! You are almost done! Step 8: Put the moon and trees on. 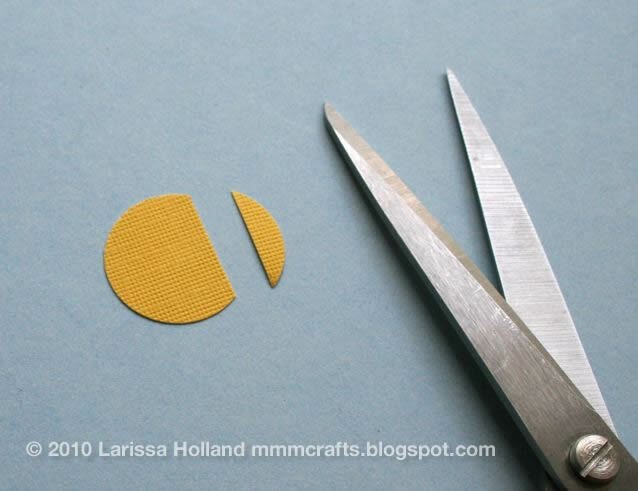 Trim off 1/4 inch of the side of the remaining yellow circle. Put a pop dot on the back. Place it about an inch down from the top on the teal background, with the cut side against the tree trunk. 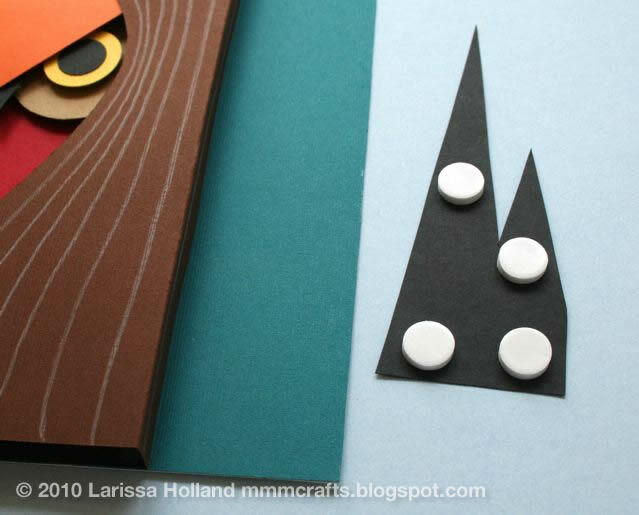 Put pop dots on the back of the black trees piece, three or four singles should do it. Place it lined up against the bottom edge and against the tree trunk. 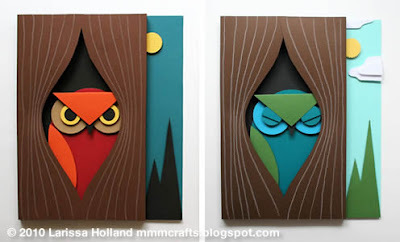 Your awesome piece of 3D paper art is done! Step back and admire it. Whoooo's a paper artist? You are, that's who! 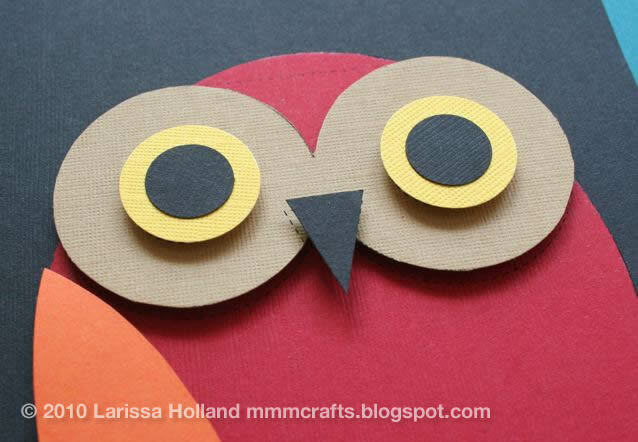 Try making just the owl in different colors as decorations for your room. Use your leftover paper pieces to create more paper art of your own design or recycle them. Your finished owl art can be displayed in an 8 x 10 shadowbox frame or by itself. Such a lovely design...again. I appreciate the tutorial and learning your tips. Thanks for taking the time. this is amazing larissa... i just tweeted the link to your tutorial... thanks a bunch! This is so cute. Love both of those adorable owls! 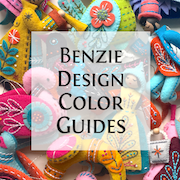 I bookmarked this tutorial as favorite. Thank you for sharing! Very cute owls you made! Great job on your guest post!!! 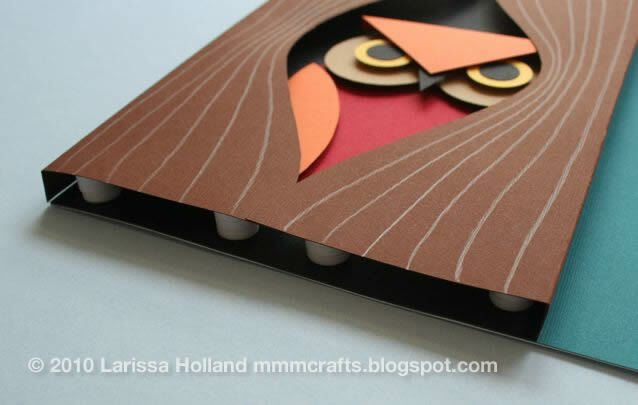 Super cute idea, too! That's wonderful - my small ones would love doing that. Thank you. 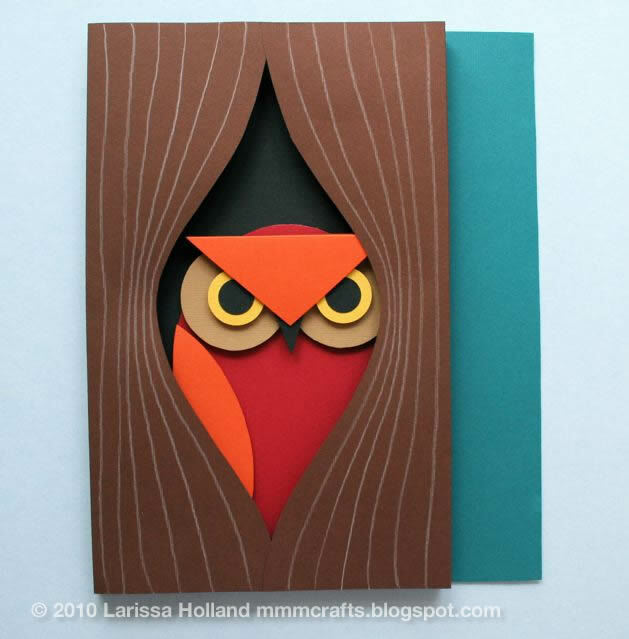 Hey, y'all, thanks for the owly love. I really enjoyed putting it together! I'm mildly obsessed with cutting paper pictures. Why not share the mania? As always, love to see pictures of what you make with it. I love Owls and this is such a cute project! Hello! I make my own owls on sketchfab: https://skfb.ly/XroT. If you are satisfied references, I'll make a model public. You can of course embed it at the end of the tutorial as an example of what else can be done.